The Mighty Regis? Lost of activity between 2007 and 2012 and nothing since? Anyone know if the band is still active. A might band. 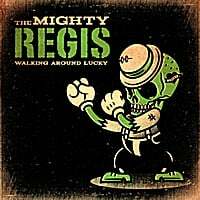 LA Party Paddies, The Mighty Regis, have a new EP out – Walking Around Lucky. This band of misfits have been bringing their brand of floor-stomping Celtic punk rock to clubs all over California and beyond for the past 4 years. While their sound is rooted in traditional Irish folk, the 7 members of The Mighty Regis inject a variety of influences into their music. Most often likened to The Pogues, who lead singer Franky refers to as “The Old Guard”, TMR also draws inspiration from such bands as The Clash, NOFX, Johnny Cash, The Clash, Bad Religion, The Mighty Mighty Bosstones, The Misfits and The Police. Its members having made ends meet in Hollywood via all manner of artistic endeavors, the entertainment value of their live show pairs perfectly with their tight musicianship. They have a rare ability to dissolve any demographic or musical genre lines and make instant fans of any crowd no matter the venue.